In our youth we looked forward to the Sinhala and Tamil New Year. Schools closed for the New Year holidays. Our homes were busy being readied for the joyous days that lasted a week or more when our parents bought us new clothes and relatives turned up often from distant towns or villages, bringing with them varieties of sweets and what were known as avurudu kavili. In distant days, relatives and friends from remote areas or villages visited close families in other distant villages, travelling in what were called buggy carts usually drawn by bulls, carrying baskets of goodies prepared by elders in their own kitchens. (Today the bulls have disappeared into ostentatious assemblies where the people listen to their cattle calls). There were no ovens and gas cookers in those distant days. They were made over firewood “lipas” as they were called then and done over several days before the dawn of the aluth avurudda. While the elders settled down to their allotted tasks we started playing out in the gardens games, now forgotten. g drums reappeared and were readied for the coming festivities just as other musical instruments preserved carefully and stored away in old pieces of furniture. They also made an appearance as elders prepared new clothes and exercised their rusty fingers for fun and games at home or in the village green. 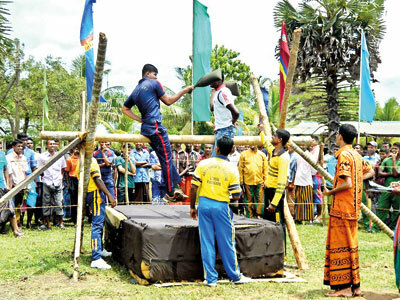 Young men in the villages oiled their muscles and prepared to knock rivals off their seats on horizontal wooden structures some feet above the ground, with stuffed pillows. That is as far as they went to show their prowess. And then on the avurudda which drags on for a week or more depending how far one would carry on with the many traditions of the past, Rate Mahattaya, Grama Sevaka, the Headman, the village schoolmaster, the Veda Rala and other village dignitaries turn up at the village green dressed in whatever regalia befits their office. But today, all that is gone. The old traditions have fast disappeared as commercialisation over-rides the fun and frolic of the past. Villages, the hub of traditions which were ‘stored’ in the ‘attic’ or other places until the next year, would be resurrected and the drums that heralded the coming festivities would begin to throb. All that has now disappeared as new towns and expanding cities creep into the villages and jungle land and destroy what is left. Rural land and the traditions that persisted for decades have fallen victim to the rapacious land grabbers and their high-rise multi-storeyed office and apartment blocks often advertised as “luxury apartments”. So the moneyed class would swallow the gimmicks and settle down in a 15th floor apartment with supposedly foreign- made appliances. In such a kitchen, where smoke extractors take the first whiff of smoke out and into the stratosphere to keep the planet clean the inhabitants of those luxury apartments are hardly likely to allow the smell of konde kavun and kokis pollute the air. That is if they had faintest idea of how to ‘get’ the konde of a konde kavun. If they wanted konde kavun and aasmi they would not ask you or me. They would head for the closest supermarket which begins to put their wares out on the shelves. Just to add a tinge of happiness to millions of parents who cannot afford to buy new clothes for their children or serve some “avurudu kema” politicians make promises they cannot keep and do not intend to keep until the next election is on the home stretch. Now the promise is to eliminate the power cuts and the water cuts. Aaa, what promises they make! So with great fanfare ministers and MPs turn up in their new luxury cars for which the people have paid, and turn on the switch that turns on the electricity that powers the whole village. Then a few months later when the villagers have covered up their dara lipa and thrown away their old kerosene bottle lamps that once lightened their homes for something more modern, the politicians and officials get together and cut off the power and return the village houses to darkness. The same happens after the same politicians in search of votes at election time bring pipe-borne water to the village and the minister or some person of minimal use to these people in a distant village arrive and turn on the pipe at the centre of the village amid the “ooos” and “aaahs” of fascinated the village kids. Then suddenly those grandiloquent ministers and officials with so many letters after their names to announce their myriad qualifications obtained from where heaven only knows, announces something more- water cuts. So now the poor villagers are suddenly caught in the cleft stick of modernity. They have neither water nor power. That is the power of politics this aluth avurudda.